The Rebel Sweetheart. : Why Cloth Diapers are Better than Disposables. Why Cloth Diapers are Better than Disposables. In the modern day, most mothers prefer using disposable diapers. But wait - cloth diapers have evolved from time immemorial to become the best-esteemed baby diapers. One no longer need pins to hold the diapers as it was before. They are healthier than the disposables because of the chemical reactions that the disposables may have. They have a shape that resembles that of the disposables such that another person may not tell the difference between two babies wearing cloth diapers and disposables. One does not need to keep buying the diapers since cloth diapers are washable as compared to disposables which the baby will only use once. 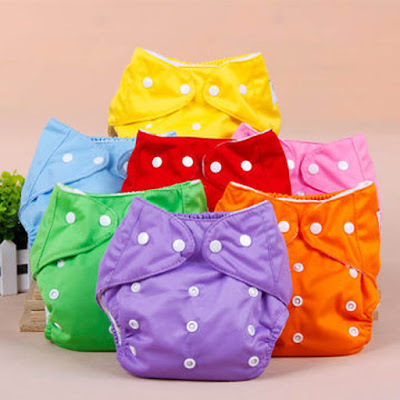 Cloth diapers are harmless to the skin because they do not contain any chemical, unlike the disposables which have sodium polyacrylate that turns to gel if exposed to moisture. Disposable diapers cause rashes which bring discomfort to the baby, especially to those who have skin reactions. For a baby to be comfortable, he will need to be changed for about ten times a day thus increasing the waste at home. If we take the average of ten diapers per day, just imagine you will need seventy diapers for one week alone! 4. Stylish and wide variety of colors. Growing up, I knew about only one color of diapers - white. These days, cloth diapers are now available in a wide range of colors and even styles. There are those that are waterproof, which functions like a disposable, but the difference is that they are washable. They are also absorbent, and can easily be folded. In the latter, you can change the cotton part as many times as possible until the cover gets soiled. 5. Diapers can be reused by the next baby. Once the first baby is able to use the potty, they can be stored safely and can be used by the next baby. Using cloth diapers goes hand in hand with incurring fewer costs of purchasing after every childbirth. 6. They do not have blowouts, unlike disposables. It's such an awkward feeling for the baby to pee, and the poop comes out with the nasty smell. Cloth diapers have an elastic which hold the baby edges so that the poop can hardly come out. It will be firm enough as the baby awaits changing. 7. Protecting the baby boy's jewels. According to a study by German scientists, the groin area has a higher temperature when using disposable diapers. High temperatures could lead to reduced sperm production when boys mature. 8. Cloth diapers are environmentally friendly. Since they are not disposed of now and then, they reduce pollution produced by the chemical substances in the disposable diapers. Cloth diapers promote early training of use of the potty. The fact that the baby feels wet will prompt the mother to train early enough as compared to the disposable diapers where the baby may feel comfortable because of prolonged changing due to high absorbency rate. It does not necessarily mean that the cloth diapers are not absorbent, but once the child is growing, the feeling of wetness is triggered faster compared to the disposables. In conclusion, the cloth diapers outweigh the disposables, and it would be great if more parents would prefer using cloth over disposables. Foodie Goodie | Allegra's Kitchen. Spotlight | Innisfree Long Wear Cover Cushion. The Benefit of Essential Oils for Women’s Health. Sneak Peek | Innisfree x Snoopy Collection. Sneak Peek | Thank You, Laneige Collection.